We call them Gods, demons, Daemons, spirits, guides, helpers. The great ones who have been here to help and guide mankind since the beginning of life itself here on planet earth. They are the true givers of godly knowledge and information. B. A subordinate deity, as the genius of a place or a person's attendant spirit. "Only the Devil promotes or advocates free-will and knowledge. Only Satan, if you think about it, in the bible, he is basically the good guy. All he was doing was revealing the truth, and giving knowledge to mankind".
" See, I have set before you today life and good, and death and evil. I have commanded you today to love Hashem your DoG, to walk in his paths, and to keep His Commandments, Decrees, and Laws. You will then live and flourish, and Hashem your DoG will bless you... But if your heart turns astray, and you do not listen... I am warning you today that you will be exterminated... I call heaven and earth as witnesses. Before you I have placed life and death, the blessing and the curse. You must choose life, so that you and your descendants will live. -- Deut. 30:15-19". Satan has told me some information concerning the wrongful information on the JoS site (this pertains to you people who assume absolutely everything on the site, including all the Demon's information is true - it's most definitely not). One should never call "Enki" Satan, for it is extremely disrespectful and wrong if origins. The Gods were never trapped in the first place, like what leader Maxine has said otherwise. The Gods cannot become trapped by the methods of man, nor would they allow such a thing to take place. Satan hears, and sees all, nothing would take in effect of a trapping of the Gods. Also, many of the sigils are wrong, as in having enemy power. Many of the Gods on the JoS site are also misrepresented, and are repeated from different names from different cultures. Much is incorrect and wrong concerning the relations with the Gods, and their information, and real purpose for humanity. Satan wishes for us to advance and better ourselves, into God-like people like him someday. We as people are extremely less significant, and probably comparable to cavemen compared to how advanced SATAN and the Gods are. There is nothing worse than allowing stupidity, and letting it breed to continue itself only to spread destruction to others in the process of life. "It is quite literally - "the worship of Demons". It is, to the modern Demonolator, the practice of calling on elemental or pure energy forces known as Demons to aid in self-knowledge, spiritual growth, and projecting one's will onto an object or person through the use of ritual magick. For the Theistic Demonolator, Demons are very real entities." - Taken from the book: The Complete Book of Demonalatry, by S. Conelly. I would highly suggest a practitioner of the Left Hand Path to definitely take money to buy, and time to read this guide completely. Here is a list and a brief description to the most significant demons, as there are thousands of these deities, we will focus mainly on those who are friendly towards us, humans. Please keep in mind that some gods/demons, have appeared more times under different names throughout history, an example of this would be the demon Astaroth, appearing as Inanna in Sumerian mythology, or Isis in Egyptian mythology - however, it is still the same entity. The basic, and often false information about demons was taken from the http://www.joyofsatan.org/ as well as the Goetia, Dictionaire Infernal, Pseudomonarchia Daemonum, Encyclopedia of Demons, and our own experiences. This is why Priestess Satanika is working on the quite tedious, and lengthy task of correcting all the falsehoods in yellow text. This is so newcomers or experienced practitioners will know the CORRECT information, and ways to summon these Gods & Demons without error, or horrible/scary consequences. If you want to know WHAT our experiences or inputs are here on the list of Demons, look for the "" symbol. Balam discerns the past and future, confers humor, wit, intellect, gives invisibility, and foretells the future. Barbatos teaches all of the sciences, he reveals treasure concealed by magic, and foretells the future. He discerns the past, reconciles friends, and will bring any two persons together in friendship. He secures the good will of those who are in positions of power. He smoothes out all misunderstandings and soothes hurt feelings. He gives the ability to communicate with and understand animals. Bathin reveals the properties of herbs and precious stones. She helps one obtain astral projection, and can take anyone wherever they want to go. She is the sister of Astoroth, and mother of Anubis. She is also the Goddess of death, dreams, protection, and rules over hidden and spiritual knowledge. Beleth brings the spirit of love between men and women. She is a favorite of women awaiting a proposal. Belial distributes presentations and titles. He reconciles friends and enemies, and provides familiars He can assist one with job promotions and helps to gain a higher position. He can bring favors from others, even one's enemies. 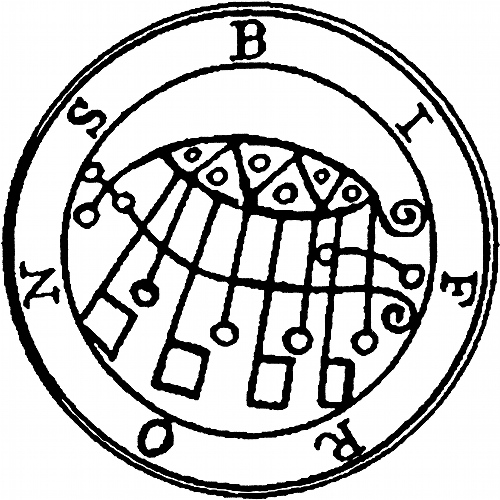 Belial was Prince of the Order of Virtues. Botis assists in making important decisions and bolsters courage. He protects one from being hurt by the hatred or envy of others and helps toward easing tension in the home. Botis declares things past and present, and reconciles friends and enemies. Bifrons teaches astrology, geometry, mathematics, along with other different arts and sciences. He reveals the properties of herbs, woods, and stones. He can move corpses magically and coerce spirits of the dead to assist in magick, and/or to answer inquiries. "Baal" means "Lord." "Baal-Berith" is "Lord Berith." He fortells the future, discerns the past, and can turn metal into gold. He helps in rising to high places and receiving honors. He speaks with a very clear and soft voice. Bune helps acquire wealth and provides sophistication and worldly wisdom. She gives eloquence in speech and a flair for words. Buer heals all diseases, and teaches moral, natural, and logical philosophy. He discourages drunkenness, and provides familiars. He also teaches the properties of all herbs and plants.